Bill Moseley has acted opposite an evil clown before, when he was Otis Firefly opposite Sid Haig’s Captain Spaulding in THE DEVIL’S REJECTS and HOUSE OF 1000 CORPSES, but now he’s donning the face paint himself for a fright film called CREPITUS, and gave RUE MORGUE some exclusive words about it. Speaking to us at the Mad Monster Party convention in South Carolina, Moseley confirms, “I’ve kind of played some unofficial clowns—Chop-Top is a clown, in a way—but this is the first time I am actually competing directly with Sid Haig! I play a scary clown who eats children; I start with their fingers, ’cause that’s my favorite snack food. I’m kind of a supernatural character, and I live in an old house and terrorize whoever comes around.” Specifically, he torments 17-year-old Elizabeth (Caitlin Williams) and her little sister Sam (Chalet Brannan) after they move into that house, where their now-deceased grandfather used to live. The cast also includes Eve Mauro (WICKED LAKE), Lance Paul, Darren Barcomb and Johnny Stevenson. CREPITUS, scripted by Eddie Renner and Sarah Renner and produced by Ginger Knight Entertainment and The Whix Company, recently wrapped its first round of filming, with the second set to take place this spring and early summer. “We shot it up in beautiful Cheboygan, Michigan, as opposed to Sheboygan, Wisconsin, in the dead of winter,” Moseley says. “It has a wonderful first-time director, Haynze Whitemore, who did a great job. Crepitus rhymes in his dialogue, so I spent a lot of time on that, getting into the rhythm of it. Part of it was also channeling John Wayne Gacy a little bit. With the clown outfit and the makeup and the rhymes, the part allowed me to explore yet another dark corner of my mind,” he laughs. 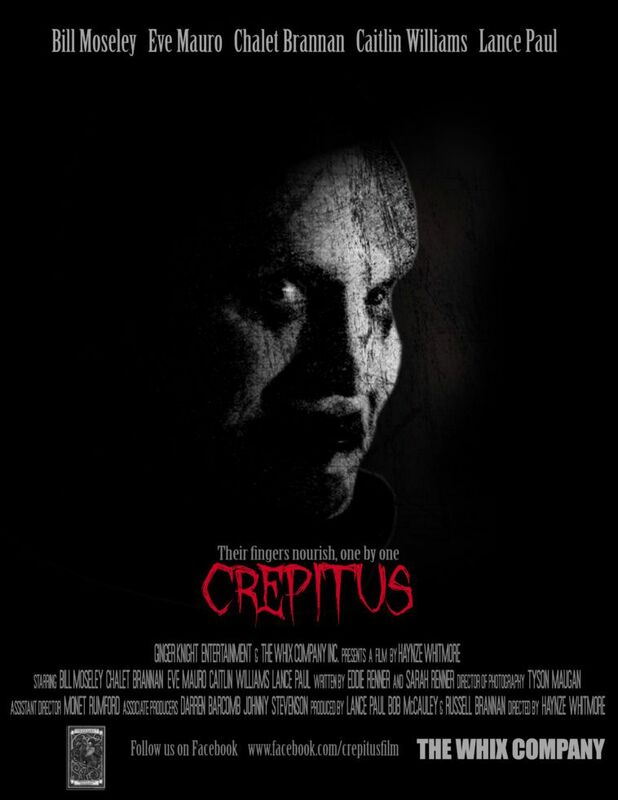 Check out the poster and NSFW trailer for CREPITUS below, and keep up with the movie at its Facebook page.